" Thirty years ago, when I had my babies, we were rediscovering natural birth and breast-feeding. But, we struggled alone during postpartum. If I had been able to read Aviva's book then, I would have cried less. Every new mother should have a copy of this book." " This is a superb and much needed book that should help and support all postpartum mothers." " Destined to have widespread appeal for its compassionate and wise advice.? Thank you, Aviva, for so much vital information in one volume.?
" Finally, a book that addresses an aspect of birthing that has been forgotten in the western world.? This book should make a valuable contribution not only to women, but to the whole family." & quot; Destined to have widespread appeal for its compassionate and wise advice.? Thank you, Aviva, for so much vital information in one volume.? "Destined to have widespread appeal for its compassionate and wise advice.? Thank you, Aviva, for so much vital information in one volume.? "Finally, a book that addresses an aspect of birthing that has been forgotten in the western world.? This book should make a valuable contribution not only to women, but to the whole family." "Destined to have widespread appeal for its compassionate and wise advice. Thank you, Aviva, for so much vital information in one volume. "Finally, a book that addresses an aspect of birthing that has been forgotten in the western world.This book should make a valuable contribution not only to women, but to the whole family." "Thirty years ago, when I had my babies, we were rediscovering natural birth and breast-feeding. But, we struggled alone during postpartum. If I had been able to read Aviva's book then, I would have cried less. Every new mother should have a copy of this book." "This is a superb and much needed book that should help and support all postpartum mothers." This book was a sacred text talking to me in real time after my first child was born, and in the weeks before as I planned for the postpartum period. The herbal remedies are easy to make and most use ingredients found easily at the local health food store, (for me that was Earth Fare). What I appreciated most was her call for a mother to draw in and respect the postpartum period as a time of healing, integration, and sanctuary. This was my instinct as a new mother, but most people around me found this strange. At the time there seemed to be no other books on the market encouraging a new mother to feel her feelings, take it slow, be honest about her desires, and ask for help after birth. This book has become a go-to gift for new mothers. I love all of Aviva's books and her practical advice. If you are having a baby or know someone who is having a baby, you must buy this book!!! I carried it all over the house with me throughout my first six weeks postpartum -- it was the cozy friend that I needed at that time, for sure. Loved it so much, I bought several copies to include in baby shower gifts for my friends. 5.0 out of 5 starsHelpful book for postpartum care of your body. I highly recommend this book. It gives a realistic perspective on what goes on with the body, heart and mind after our babies are born. After the birth of my first baby, I was a shocked at how long it took my body to recover and most friends and family had very little to say me about what a new mom needs to do help the body balance. I was a little disappointed actually so I decided to do more research about how to take care of myself postpartum now that our second baby will be arrive this January. After reading this book, I feel like I can put together a better plan for rest and have found more ways to heal the achy bits after the baby is born. I think in the West, we have this feeling like we should be able to "do it all", even after giving birth. When first taking care of newborn son, I called my mother telling her how challenging it was to get rest and take care of the home. She said to me, "What's the big deal taking care of just one baby? I had four of you and no help!" But I remember, she was exhausted. 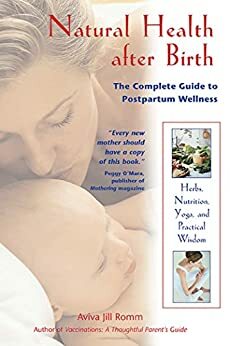 This book suggests that we DO need help and time to rest after birth, whether or not you have one child or four children. I appreciate that. 5.0 out of 5 starsIf you like Ina May’s Childbirth Guide, this is a good resource for you postpartum. Recommended to me by my midwife. Would have read sine parts prior to delivery to help understand postpartum phase better ahead of time had I known about it. 5.0 out of 5 starsExcellent! Must read for pregnant women! This book is a wealth of information and has recipes, herbal recipes and ideas and advice on making your postpartum the best ever! I read this while pregnant with my third child and I still found a lot of new information. This definitely has a natural parenting approach but is equally beneficial for all "types" of parents.